Enriched with shea butter, this creamy and non-greasy moisturiser nourishes and protects hands, leaving them delicately scented. Contains cherry extract from Luberon, Provence. In Provence, cherry trees bloom creating a magical landscape of light pink flowers. L'Occitane's best selling fresh and floral fragrance range celebrates the poetic beauty of Cherry Blossom and its delicate flowers during the first days of spring. 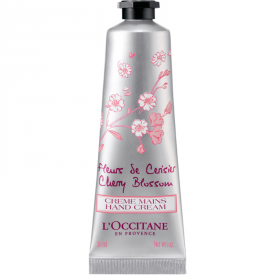 L'Occitane Cherry Blossom Hand Cream is suitable for all skin types, it moisturizes my skin, soften and smooths my skin evenly and i take it with me every where, it has a lovely cherry scent that makes me calm and feel fresh. i would definitely recommend this product. I adore L'Occitane hand creams, if it were not for their price, I’d buy them all and each day used a new one. 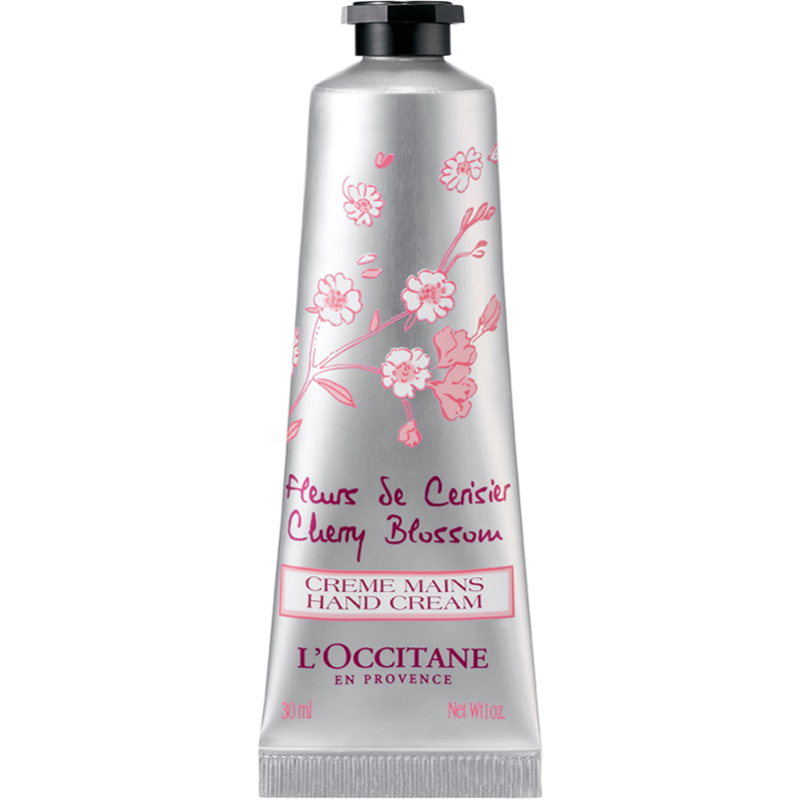 Cherry blossom is another magnificent cream, deeply nourishing and moisturizing it tantalizes with sweet floral aroma which linger on the hands even after a mild washing (with soap). The cream absorbs well and does not create any film or greasy stains – in 2-3 minutes after of application there is no danger of staining anything. The cream is not densely or heavy textured, thus upon squeezing sometimes you can get extra amount since it is a bit runny. The cream is also a great tool to take out with you anywhere – its small size and convenient design makes it a great companion. 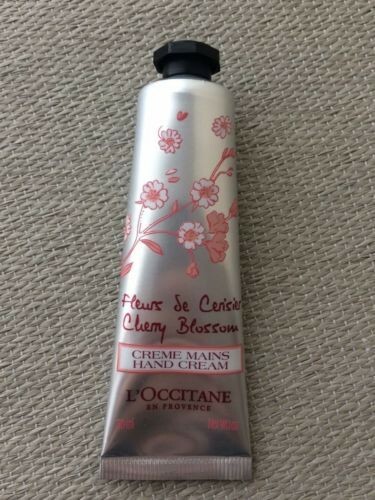 Cherry Blossom & Handcream? not so sure! Cherry Blossom and Shea butter, great combo! It should be, but it wasn't as inspiring as other handcreams in the range.As with all shea butter products from L'Occitane, (shea being their staple ingredient throughout their range) it has fabulous properties that help greatly with dry skin. Its lighter on application, a little too much glycerin for me. It smooths across the skin in a lighter texture. I love the way it makes my hands feel, soft and well nourished. The texture is never greasy/tacky. Having Cherry Blossom as an added ingredient scent wasn't what i expected, too much floweral tones. I wasn't expecting it to be so strong in its smell, but it's was. It starts off a very delicate, light scent,then it gets stronger. I found myself very tempted to wash it off. I ended up getting my shea butter handcream and working it over it. My daughter loved the scent, i suppose that's where we are different in our scent notes. These handcreams are great in the winter months due to the rich shea that protects the skin. The 30ml (normal) size is around £8.00 but it is well worth its price as you dont need a massive squeeze of cream to achieve wonderful results. Brill handy size for your bag. I would recommend it as its is a great handream, just not for me. 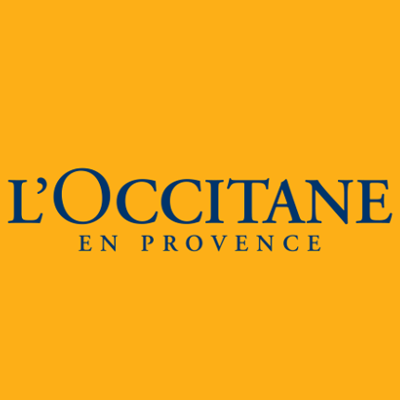 L'Occitane has a superb range of handcreams, all of which are excellant. This is another beautiful hand cream by L'Occitane. It is not the most powerful cream of the range but highly moisturising and very rich. I adore the packaging which is so handy and ensures that you can get every last drop of cream from the tube. The scent is pure heady lavender and the scent lingers subtly on the skin for hours. This cream is not greasy or sticky and your skin drinks it in rapidly upon application. After continued use you will see an amazing improvement in your hands and their condition. The tube lasts for months with constant use due to its high concentration. Highly recommended!! This is another beautiful hand cream by L'Occitane. It is not the most powerful cream of the range but highly moisturising and very rich. I adore the packaging which is so handy and ensures that you can get every last drop of cream from the tube. The scent is pure floral cherry blossom which is not overpowering and the scent lingers subtly on the skin for hours. This cream is not greasy or sticky and your skin drinks it in rapidly upon application. After continued use you will see an amazing improvement in your hands and their condition. The tube lasts for months with constant use due to its high concentration. Highly recommended! !